So during this month of #bloglikecrazy, I decided I would explore other topics on my blog. And one thing I love, all most ags much as I love fashion is football. So today I am reviewing the restaurant I dined at on Saturday. While many of you were tailgating on college campuses, I was in the midst of football fanatics as well. No I didn’t experience the historic win in T-Town yesterday but I did get a snippet of the feel from the energy the fans were giving at The Southern Kitchen and Bar. One thing I know for sure, there are two things we love in the south and that’s our food and our football. So, what better place to be than a place proud of its southern roots and who’s not afraid to serves it up in every dish. Sitting there having good conversation with a great friend, at times I would be shocked by all the screams and clapping. With plenty of screens available, every football fan could find something to watch. The restaurant dubbed itself a “casually chic atmosphere offering the best entertainment with the hospitality of a true southern gem.” And I must agree. It is definitely a great place to just hang and it has plenty of seating including a spacious bar that boasts an impressive array of alcoholic beverages to keep the party going. The menu has southern comfort written all over it. 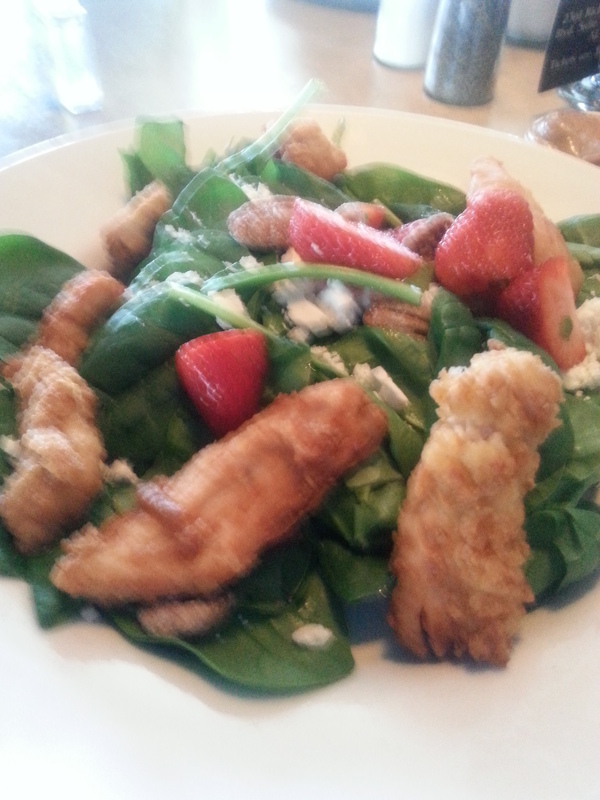 Yesterday, I had the Savannah Salad with fried rotisserie chicken and balsamic dressing. It was very tasty. The thick creamy dressing puts you in the mind of a gravy but I still like it. And I loved the candied pecans. They gave a burst of sweetness in every bite especially teamed with the fresh strawberries and feta. But the fried rotisserie chicken keeps me coming back for more. The first time, I had The Jefferson which is a delicious entree that includes the rotisserie chicken over southern spiced turnips and a side of Alabama gouda grits. Those grits were so good. And for seafood lovers, you can get shrimp instead of the chicken. So next time you want a little southern hospitality, go downtown Birmingham and check out The Southern Kitchen and Bar at Uptown. Sounds like my kinda place..Sizablechic has my vote..Keep up the good info…How about a movie review now and then…Just a thought. I have so many interests that I would love to explore. I give that some thought. Thanks for reading.